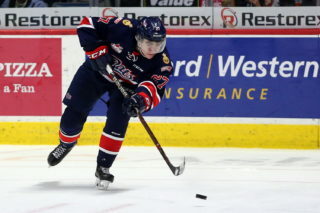 The Regina Pats (12-30-1-1) return to action on Wednesday night on home ice against the Kootenay ICE (9-29-6-1). Puck drop is at 7:00 p.m. at the Brandt Centre. The Pats were last in action on Saturday at home to Red Deer and fell 9-4 at the hands of the Rebels. The ICE were in Swift Current on Tuesday night and snapped a nine game slide, beating the Broncos 2-0. Tonight is the third of four meetings between the Pats and ICE, Regina took the first meeting on the road in October, but lost the second in Cranbrook in November to sit 1-1-0-0 against Kootenay this year. Tonight’s game can be heard with Bennett Dunlop Ford Pats Hockey starting at 6:35 p.m. on 620 CKRM. 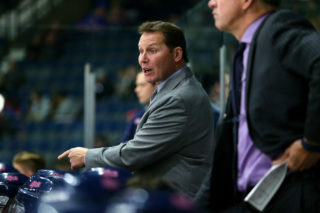 The Regina Pats lost a wild one at the Brandt Centre on Saturday, 9-4 at the hands of the Red Deer Rebels. Red Deer scored twice in the first to lead 2-0 at the break and then added another early in the second to go up by three. Sebastian Streu got the Pats on the board on the powerplay with a one-time shot from the left circle for his fourth of the season. Red Deer came back with two in a row to take a 5-1 advantage. Garrett Wright drew the Pats within three later the in the second, his third of the season, and it was 5-2 after 40 minutes. In the third, Duncan Pierce scored 1:22 in, his fifth, and the Pats were within two. Red Deer restored the three-goal lead two minutes later, but again the Pats cut the lead to two thanks to a goal from Brady Pouteau. His first of the season came shorthanded and the Rebels lead was 6-4. Red Deer came back and scored three times in the final six minutes to pick up a 9-4 road win. The shots on goal were 28-28, Regina was one for six on the powerplay and two for four on the penalty kill with a shorthanded goal. Duncan Pierce and Brady Pouteau led the offence with a goal and an assist each. 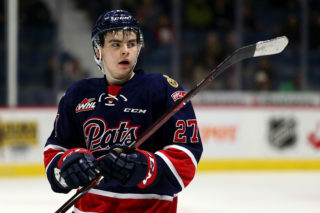 The Pats put up four goals in a game on Saturday for the first time since trading Jake Leschyshyn and Nick Henry to Lethbridge, a span of 19 games. The Pats have scored 41 goals in that stretch for an average of 2.16 goals per-game. Conversely, the Pats have given up 76 goals, an average of 4.00 goals against per game. However, the Pats have been much more stingy since the Christmas Break, in 10 games since returning for the second half of the year, the Pats have given up just 37 goals, an average of 3.7 per game, but if you take away Saturday’s nine goals against, they have averaged just 2.8 goals against in the other nine contests since the break, and scored 2.3 goals a game. Pats overage defenceman Brady Pouteau scored his first goal of the season on Saturday, a shorthanded marker in the third period. 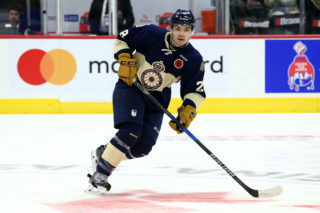 Pouteau also had an assist on Saturday and has points in consecutive games, scoring once and added two assists over the weekend. For his career, Pouteau has scored five goals and 32 assists for 37 points in 177 games. 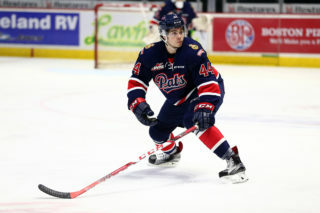 Pats forward Austin Pratt set a new career high in points for a season on Saturday with an assist against the Rebels. The 19-year-old is up to 16 goals and 19 assists for 35 points in 44 games this year. His previous career high was set two years ago in Red Deer where he had 16 goals and 34 points. Pratt is up to 101 points in his Western Hockey League career, 47 of them goals.